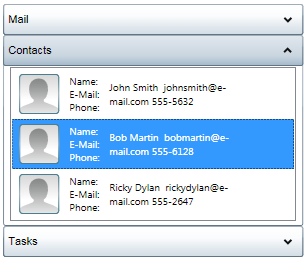 Display a list of expandable items with ComponentOne Accordion for WPF. When one item is expanded, all others collapse. Complete with smooth animations, the Accordion control helps organize your UI and optimize the use of screen real estate. Because the Accordion control inherits from ItemsControl, you can bind it to any collection of data objects. Use the control to provide drill-down on a list of items and, like any ItemsControl, use a data template to create a visual representation of each item. Expand the accordion up, down, left, or right. Down, the default setting, displays content below each header. Customize the fill behavior with a single property setting. Use the simpler Expander control to expand and collapse a single UI container. Customize the header with any UI controls, expand the control in any direction, and choose whether or not it’s expanded upon page load. Because the Accordion control inherits from ItemsControl, you can add objects of any data type to its Items collection and use a DataTemplate to create a visual representation of the items. An accordion pane's header can be customized with both text and controls. For example, you can display an icon and text in each header. 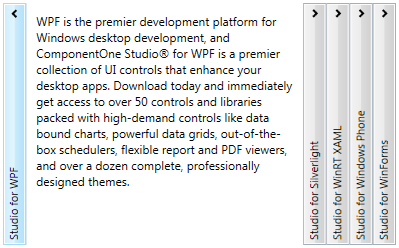 Because Accordion for WPF supports ComponentOne ClearStyle™ technology, you can change control brushes without having to override templates. 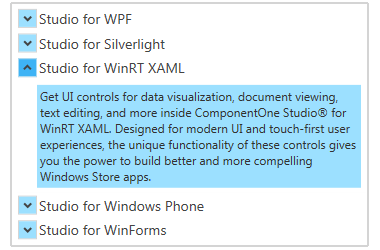 By setting a few brush properties in Visual Studio, you can style each part of the accordion.